Listed here are Practitioners that have taken April’s courses and submitted their case studies for approval. These equine bodyworkers have set high standards for Equine Whole Health and Wellness and I highly recommend them to you. Dawa Fitzmaurice, CMT – Certified Instructor: Levels 1, 2, and 3 Nevada City, California H – 530-392-4108 W – 262-957-7628 Dawa@BlissfulEquine.com www.BlissfulEquine.com I am an equine intuitive empath with 17 years experience as a Reike practitioner and certified massage therapist. My journey as a holistic horse practitioner began when my beloved horse Merlin suffered form a mysterious lameness that seized up his whole body. There was nothing the vet could do. I have devoted myself to the study and practice of alternative healing therapies for horses and have seen miracle after miracle. Merlin is thriving and for several years I have been helping other horses in their healing. I love to see how each horse shines with health and vitality when I am done working on them! I have completed April’s courses in “Equine Muscular Skeletal Unwinding” and “Applied Kinesiology” and “Cranial Sacral”. Jen Allen 815-303-1958 sydney1410@yahoo.com North-Central Illinois; based out of Princeton, IL, and will travel out 1-2 hours, depending on amount of horses and trip charge. I have had a lifetime working with horses, with ten years of endurance riding, studying movement and biomechanics, nutrition, and lamenesses. I started April’s Holistic Horseworks bodywork to help my horse move and feel better. The transformation I have seen in these horses is nothing short of amazing! I love the whole-horse approach April teaches, and am excited to continue growing in my equine bodywork capabilities! April Schaeffer, CESMT 618-409-0377 aschaefferequineservices@gmail.com Facebook: April Schaeffer Equine Bodywork Services, CESMT Level 1 As a CESMT, I found this course to be very interesting and look forward to incorporating it into my Massage program! I look forward to achieving level 2 and 3 along with the cranial work..however, I have found the home study correspondence to be insufficient for the depth of the information. I’m a visual learner so I would need to attend classes for future certifications. Kila Butler Central Minnesota 218-616-0586 Coondogup@aol.com Malinda (Sissy) Deitchler 27500 Co Hwy 48 Osage MN 56570 218 255-1712 Completed Level 1 Equine Unwinding, massage, and essential oils. I started doing April’s program after a friend introduced me to what she was doing and I wanted to learn it for myself. I’ve used essential oils with massage to release pains and sore muscles. I’m also certified in Animal Telepathy- Animal Communication understanding animals in a very much deeper level. Emily Arnold- Level 1 Big Rapids, MI (989) 317-5871 emily28arnold@gmail.com I have absolutely been amazed with the results from the Level 1 work I have been able to do after April’s instruction. She has been wonderful with answering questions and helping me to get these performance horses WELL again! I am very much looking forward to completing the Levels 2 and 3 courses and learning even more from April! These certifications and knowledge will be great assets to my office and allow me to help equine athletes perform at their peak and bring comfort to those special horses who have other purposes as well. Layla Harris Horse Led Healing Serving Central Texas Austin/BCS/Houston/DFW (209)230-0708 HorseLedHealing@hotmail.com Follow me on Facebook and Instagram @horse_led_healing Website coming soon! I’ve grown up around horses my whole life and showed Children’s Jumpers on the A circuit and held many championships. 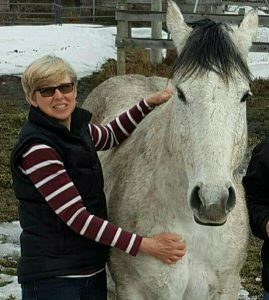 As a young adult I assisted in my mother’s lesson program, gave beginner lessons, and ran camps and I began doing bodywork professionally on horses in 2014 using red/infrared LED lights. I love the results I’ve gotten using the light treatment on over 500+ treatments performed. The only downside is that I kept finding similar patterns and knew I needed to dig deeper and find an even more holistic program that I could implement into my program… that’s when I discovered April Battles in 2015! I’m so grateful for her contribution to this industry and for sharing her wisdom through her clinics and beyond. If you’re in Central Texas, feel free to contact me and let’s see what I can do to help you and your horse on their healing journey! Happy Healing! Gérard Mélanie Paris, France Completed all 3 levels Email : contact@bodywork-equin.com Website : www.bodywork-equin.com Facebook : www.facebook.com/Bodywork-équin-166688220540186/ Brief introduction : Passionate about dressage, I naturally had to question myself and seek answers on the locomotion of the horse. From this quest for just locomotion, I became interested in fields as vast as equine podiatry, nutrition, naturotherapy and of course bodywork. Areas that are totally complementary to each other and for which we can’t hope for results without considering a global management of the horse. The idea is to help the horse to give us the maximum of his potential with the least amount of restraint, to have a joyful and expressive partner. What is called a « brilliant” horse! Naturheilpraxis fuer Tiere Barbara Landinger Phone: 0173 39 84 804 Email: barbara@ab-landinger.de Web: ab-landinger.de Germany /Bavaria What I offer as a holistic animal practitioner: Homoeopathic Remedies, Bach Flowers, Schuesseler Salze, Massage, Touch for Health (Kinesiology), Acupressure, Reiki Master, nutritional counseling , regular health check up. Cranio Sacral Therapist for Horses + Completed level 1 Equine Musculoskeletal Unwinding. Horses are being viewed as a totality of various physical, emotional and mental layers when treated holistically. Therefore, I look at possible issues with a broad view and address any problems at the origin instead of (temporarily) solving the symptoms. For this reason I combine different types of therapies and also assess the horses management, nutrition, training, harness, teeth and hooves. Follow us at Instagram and Facebook @De Paardentherapeut. Website: www.natuurlijkewending.nl Completed: level 1, 2 and 3 About: My name is Lisette and I love working with animals. I am a holistic therapist for animals and I help animals with manual therapies, aromatherapy, herbs, flower essences and much more. I’m also a centered riding teacher and horse trainer. The bodywork of Holistic Horseworks is very useful and every horse I train gets a treatment first. For me the bodywork for horses is a prerequisite to start good training and teaching. It removes a lot of training, motion, health and behavioural problems. It makes horse training and teaching much easier, healthier and more fun for horse and rider. Areas: I work in Europe, mainly in The Netherlands and Spain. Horses: holistic horseworks bodywork and cranio, horse training, body rehab program for horses with issues, hoof anaysis and hoof correction. Riders : Riding lessons, seat education and body awareness for the rider. Ann Baron bbaron2@mymts.net Level 1 & 2 Instructor H: 204-834-2087 Mobile: 204-476-0057 I grew up in Sweden, out in the country were animals quickly became my best friends. Horses got to be my favorite animal when l was in my teens and my sisters and l found a trotters stable in our area. We visited the horses and soon started working with them. From this time on, horses have always been in my life. In 2013, l had my horse Skor with multible problems. He had had a fracture in his right hind leg that had started to heal. But now he was so unbalanced that he had a hard time walking properly, and a terrible time lifting his feet for the farrier. l was googling on my computer, looking for answers when l found April Battles! The more l read, the more interested l got. I ended up sending some pics and had April Battles do her Distant Listening on Skor. The results soon showed up, and l was overwelmed! So much work that he needed done! I started looking for April Battles’ Clinics and found out she was scheduled to go to Manitoba that very year! That Clinic ended up being canceld, and April Battles asked me if l would be interested in Hosting. Sure l was! I wanted so bad to learn how to help my horse! So in August of 2013 l Hosted Level 1 in Carberry Manitoba. That lead to Hosting Level 2 in 2014 and Hosting Level 1 and 2 + helping to teach both courses in 2015. In 2016 l traveled to Galt California to retake and help teach Level 1 & 2 and also take my Level 3. Over the years since that first Clinic l have been working on horses in our area and also in Sweden, and on our own horses, of course! Working with horses is so rewarding; to see them getting relaxed, out of pain, being able to move the way the were born to do. l can’t think of a better thing to do! I have been teaching one on one or groups, either one is very workable. I am willing to travel to your barn. It can be to any province in Canada or could be to Sweden! I am super excited being certified in Level 1 Equine Musculoskeletal Unwinding. I am a Bowen Therapist and Animal Bowen Therapist, treating people, small animals and now Equine. Being a horse enthusiast since I was young, it is very humbling to be able to help people and animals. I am thrilled I took the jump and decided to embark on my dreams of assisting people and animals. I will be working in the Stirling and surrounding area, willing to travel to barns outside of this area.